Head down to the boardwalk with the We family. The family loves the Disney Dream and Castaway Cay. That's HGTV's call to action to create We Cay. The crew creates a sandy beach with a 40-foot long boardwalk right in the Wes' backyard, but the fun doesn't stop there. The Wes are getting a new lagoon pool, a bridge leading to their own private island and some fun Nemo-inspired water features. Plus, Mom and Dad aren't left out. They get their own private cabana. There's plenty of Disney magic in store as My Yard Goes Disney. 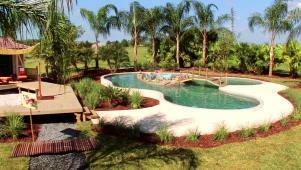 This huge backyard is transformed into a beach resort with its own swimming pool island.